Before starting to read this chapter ask yourself or share with friends: What are the most important things to attend to when preparing a dinner. Do I find the Eucharist nourishing for my spirit? In what ways? A feature of Luke’s gospel is the surprising number of meals that Jesus shared. In every chapter, he seems to be either going to a meal, having a meal or coming away from a meal! Meals were important to Jesus as they are to us. Ideally, at the end of the day, the family sits around the table to enjoy dinner together. Sadly, this is happening less and less because of the many activities that family members are involved in and the dominance of the TV. When people do come together for a meal, it’s not just to nourish their bodies but to enjoy each other’s company, to build up their relationships, to share what’s been happening in their lives. Food gives life, so the sharing of food is the sharing of life. Jesus invites us to share in his divine life when we accept the sacred food he provides for us. Jesus ate meals with people of all levels of society though he showed a preference for eating with the lowest classes. Not only was this most unusual it was breaking one of the strict taboos of Jewish culture. The link between disability and sin was deeply embedded in the culture, but Jesus rejected this assumption. Priests of the Old Testament (Aaron and his descendants) were required to be physically whole. This is the mind-set that Jesus was coming from. But Jesus blew apart this exclusivity by inviting to his meals those who were usually on the ‘don’t invite’ list. And what did people think of this behaviour? Jesus reported to the crowds how neither the austerity of John the Baptist nor his own openness to all pleased ‘this generation’. Tough times! Dominated by severe, exclusive laws! By knowing something of this background, knowing where Jesus was coming from, we get an idea of how utterly revolutionary Jesus was in eating with sinners and the disabled. By eating with the outcasts of society, Jesus was departing radically from the customs handed down for generations and he was putting himself at risk from the guardians of the law. A sign of what? The manger was a feeding box for animals, so the infant Jesus is shown as food for creation from the moment of his birth. The word that Luke uses here for ‘wrapped’ is also the word he uses when he says that after Jesus died his body was ‘wrapped’ in a linen cloth. In connecting Jesus’ death to his birth in this inclusive way Luke reinforces the idea that Jesus’ whole life is God’s food for a hungry creation. I have come to call not the righteous but sinners to repentance. (Luke 5:27–32). Meal times seemed to be favourite occasions for Jesus’ ministry. It was during a meal at a Pharisees’ house that ‘a woman who was a sinner’ intruded into the exclusive company and dared to wash Jesus’ feet with her tears and wipe them with her hair. (Luke 7:36–50) The Pharisee host was indignant that Jesus would allow the sinful woman to touch him but Jesus rebuked him for his lack of hospitality and commended the woman ‘for showing great love’ and said to her ‘Your faith has saved you; go in peace’. 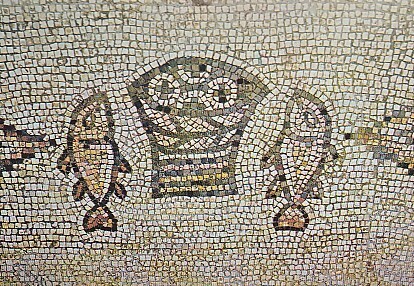 The Last Supper was the culmination of the sequence of meals that Jesus shared as a prominent and distinctive feature of his time of ministry, and it was during this final meal that Jesus instituted the Eucharistic banquet from which we draw nourishment for our spiritual journey and in which we share his company. The Eucharist is the primary way that Jesus gives himself to us as food: first, in the liturgy of the Word, teachings that we take in and digest. Jesus’ wisdom nourishes our spirits and shows us the way forward step by step. Jesus’ teachings are so universal they can apply to any era with only some modification for the culture. The gospel reading at Mass provides rich food for our spirits and close attention ensures we don’t miss any crumbs. Private reading of the following Sunday’s gospel and discussion with a few other parishioners or friends would contribute immensely to a better assimilation of the meal – pre-dinner drinks with nibbles! As we eat his flesh that was sacrificed for us, we are made strong, and as we drink his Blood that was poured out for us, we are washed clean. He tries to lift their aspirations from the material to a spiritual level, and encourages them to believe in him, but the people ask for a sign, a work to warrant believing in him and they remind him their ancestors ate manna in the wilderness. Jesus replies it was not Moses who gave this ‘bread from heaven’ but God, and God would give them ‘the true bread from heaven’. What an audacious and momentous statement! By saying ‘whoever comes to me’ Jesus is again breaking down Jewish exclusivity; Jesus is food for the world. Jesus points out that those who ate the manna, even Moses himself, are now dead, but those who eat the bread that Jesus gives will have eternal life. The bread that I shall give is my flesh for the life of the world. Jesus was giving this discourse while teaching at the synagogue in Capernaum (verse 59) during Passover time (verse 4). It will be at another Passover meal that Jesus will fulfil his promise of giving people his body to eat and his blood to drink when he institutes the Eucharist. When reading this chapter, and indeed, any part of the Bible, we have to understand the translation of words from Hebrew, Greek and other ancient languages is quite hazardous. We can be easily misled when we presume the literal meaning of the words. Just a few examples: ‘body’ in English means the physical body, whereas in Scripture it often means the whole person. ‘Blood’ often refers to life as there is no life without blood. Sometimes, as with Jesus at the Last Supper, it refers to a person losing their life by the shedding of their blood, that is, someone who is going to die. We need to take special care when reading John as he likes to be poetic and metaphorical. ‘Bread’ can refer to wisdom as in ‘Come, eat of my bread and drink of the wine I have mixed’. (Proverbs 9:5) Jesus’ teachings are full of wisdom, how to live a fulfilled life, and we understand he is sometimes using the word ‘bread’ in this way. If God were to appear to starving people, he wouldn’t dare appear in any form other than food. Our human spirit cries out for nourishment just as our bodies crave daily food and our minds thirst for education. The Eucharist is the spiritual nourishment that Jesus provides.